One thing I love about eggplant is that you can turn this humble fruit into something delicious. When I was little my mom had a menu she would follow for the week. A lot of dishes she would cook had eggplant in it. They may not be gourmet dishes but how she managed to give them a new twist to taste just as good, it still amazes me up til now. (Mommy is one of the best cooks I know. Believe me. I'm not the only one who said it) Now that my sister and I are grown the legacy of our mom continues. Last night my sister brought home 2 large eggplants. When she showed me the purple fruit, the first thing that came to mind was to make moussaka. I had been craving for this Greek dish for so long. The last time I had it was February and I already missed the flavor. Moussaka is a Greek dish of layered eggplants, meat and bechamel sauce. The first time I learned about this casserole was in 2002 when I saw the movie My Big Fat Greek Wedding. When I heard the lead actor say her lunch was moussaka, I got intrigued. I checked the web and learned that it's an eggplant casserole. Boy was I glad. Typically meat sauce in moussaka is made from either ground beef or lamb. Some people use ground pork. I used tuna in place of meat. My sister doesn't eat meat at all but she still includes fish, dairy and egg products as part of her diet. I cut down on my meat consumption. I eat chicken or beef once or twice a month. Like I said before we're going vegetarian. Eggplant slices can be broiled or fried. I broiled mine. I made the tuna sauce from what I had in stock. 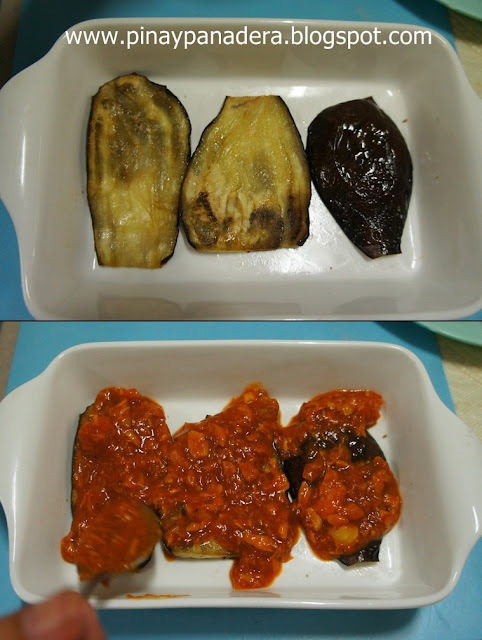 Preheat oven to 204 deg C.
Brush both sides of eggplant slices with oil. Season with salt and pepper. Broil for 5-6 minutes until browned.Turn and broil the other side for another 5 minutes. While the eggplants are in the oven. Cook the sauce. Melt butter. Saute garlic and onion. 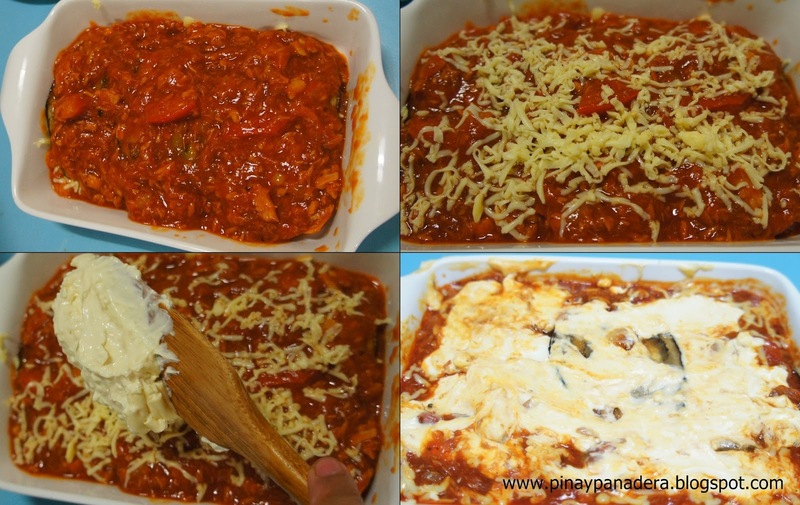 Add diced tomato.Cook until softened about 2 minutes. 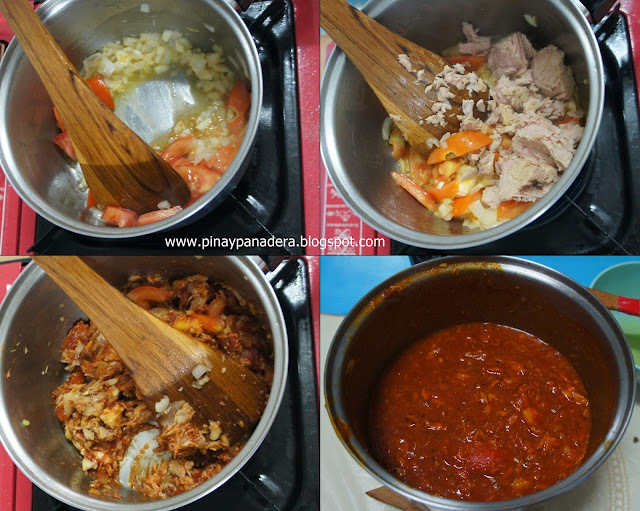 Add tuna.Stir in tomato paste, pasta sauce, water, mixed herbs, salt and pepper. Cover. Let boil for 5 minutes. In a small saucepan, stir together cream cheese, milk, salt and pepper. Warm over low heat until just melted. Lightly grease a 7 1/2 x 4 1/2 pie dish. Layer the eggplant, then the tuna sauce. I got quickmelt cheese from a friend. I wanted to know how it would taste so I used it in place of parmesan. And yeah,it did make a difference. Grate the cheese over the tuna sauce. Repeat the layering process a second time. Spoon the white sauce on top.Bake at 175 deg C for 2-3 minutes or just until the white sauce starts to brown. I found the white sauce to be too rich. I will add half a cup of milk to cream cheese next time I do this.